So sorry to have been AWOL from blogging for a while! On top of trying to get back to normal after the Holidays, I've had a deadline to meet and LOTS of computer trouble (which I hope is over now). I hope to be reinvigorated in the kitchen very soon! In the meantime, here is a recipe for one of our favorite bread recipes-- so good with a bean or vegetable soup! 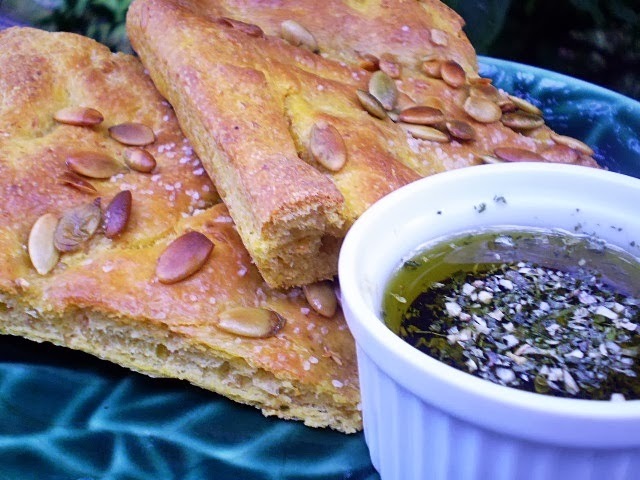 This is a delicious and nutritious version of focaccia, perfect for winter meals. IF YOU ARE MAKING THIS BY HAND, OR WITH A HEAVY-DUTY MIXER, stir the yeast into the warm water in a large mixing bowl, or bowl of your stand mixer. Let stand 5 minutes. Add the oil and pumpkin. Add the bran, flax, and salt, and then the flour in two additions. Mix until the dough comes together. Knead the dough for about 10 minutes, either by hand on a lightly floured surface, or with the dough hook of your heavy-duty mixer, until the dough is velvety, firm and slightly sticky. IF YOU USE A FOOD PROCESSOR, mix the flour, salt, bran and flax seed in the processor bowl. While the machine is running, add the mixture of water, dissolved yeast, oil and pumpkin until the dough forms a ball on top of the blade. If it's too dry to come to a ball, add water a few DROPS at a time until it does. Process for 30 seconds. IF YOU USE AN AUTOMATIC BREAD MACHINE, choose the Dough Cycle, which will mix and rise the dough, but not bake it. FIRST RISE: Place the dough in a lightly oiled bowl, cover tightly with plastic wrap, and leave to rise until doubled, about 1 1/2 hours. SHAPING AND SECOND RISE: Punch down the dough and roll it and pat it into a rectangle to fit a well-oiled 11 by 15" cookie sheet, and stretch the dough toward the edges. Cover with a damp towel, let sit for ten minutes, and then stretch a bit farther to the edges. Cover again and leave until doubled, about 45-60 minutes. Just before you are ready to bake, dimple to dough with your fingertips. Brush with the olive oil, and sprinkle the pumpkin seeds and salt over the dough. Bake for 20 minutes, or until golden. Remove from pans immediately and cut into 12 squares. Serve while warm and crispy, if possible. Nutrition (per 1/12th ): 236.9 calories; 26% calories from fat; 7.3g total fat; 0.0mg cholesterol; 474.8mg sodium; 176.4mg potassium; 36.4g carbohydrates; 3.6g fiber; 0.9g sugar; 7.3g protein; 4.6 points. An easy, healthful recipe to start the New Year! (I will start blogging in earnest soon, I promise!) Happy New Year, everyone! This new version is super-easy and a bit chunkier, spicier and creamier than the older one that is in my book "The Fiber for Life Cookbook"-- very yummy! In your soup pot, heat the oil over medium-high heat. Add the onions, celery, carrots and garlic. Saute for several minutes, until the onions have softened, adding a squirt of water as necessary to keep from sticking. Alternatively, microwave the mixture in a covered microwave-safe casserole for about 7 minutes. Either way you cooked it, mix the onion mixture in the soup pot with the grated ginger, curry paste or powder, chile flakes and cumin. Stir over medium-high heat for a minute or two. Stir in the broth and add the peppers, tomato juice, chickpeas and vegan "chicken-y" strips. Bring to a boil, then turn down to a simmer, cover and cook for about 10 minutes. Stir in the coconut milk (or alternate) and the apple and simmer for about 5 more minutes. taste for salt and pepper. To serve, add about 1/2 cup of steamed brown rice into the middle of the soup in each bowl.